Sukanya Samriddhi Account is most popular investment scheme for girl child. This scheme was launched by Prime Minister Narendra Modi under “Beti Bachao – Beti Padhao (BBB)” Initiative. Primary objective of Sukanya Smariddhi Account is to create big corpus for girl child for her education and marriage. I have already discussed about features and benefit of Sukanaya Samriddhi Account in my earlier post. In this post I will discuss about returns given by this scheme. 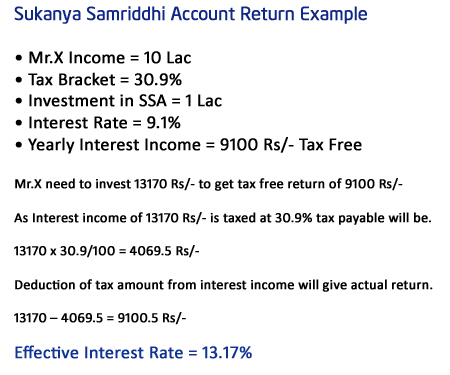 How Sukanya Samriddhi Account can give return up to 13.17%? Rate of interest applicable on Sukanya Samriddhi Account for financial year 2015-16 will be 9.1%. This rate of interest will be changing every year and will be decided by government every year. So far this scheme is looking very lucrative and offering highest rate of return. First exemption is contribution to investment under this scheme. Amount invested under this scheme can be claimed for deduction under 80C. Second exemption is accumulation of interest. This interest amount will be not added in total income and will not be taxed. Third exemption is maturity or withdrawal amount. This amount will be tax free. So, Sukanya Samriddhi Account will give triple tax benefits. Considering EEE benefit effective return on Sukanya Samriddhi Account will be 13.17% for tax slab of 30.9%. You must be wondering that interest rate applicable on sukanya samriddhi account is 9.1% how it can be 13.17%? Don’t get confused interest rate on this scheme is 9.1% but if you consider benefit given for EEE effective rate of return will be 13.17%. To explain this let’s take example of Mr.X. Taxable income of Mr.X is more than 10 Lac. As per current rule Mr.X come under 30.9% tax bracket. If he invest 1 Lac in Sukanya Samriddhi Account he earns 9100 Rs/-. Now if this return is taxable he has to pay 30.9% tax on this interest income. Considering above scenario one need to earn interest income of 13170 Rs/- to get tax free income of 9100 Rs/-. If interest income of 13170 Rs/- is taxed at 30.9% tax payable will be. If we subtract this tax amount from interest income we will get actual return. So considering this logic effective interest earned on Sukanya Samriddhi account for tax bracket of 30.9% is 13.17%. Effective rate of return on SSA for person under tax bracket of 20.6% will be 11.46%. Effective rate of return on SSA for person under tax bracket of 10.3% will be 10.15%. By this way we can say that effective rate of return for Sukanya Samriddhi Account is 13.17%. Triple tax benefits, safety and highest rate of return make this scheme very attractive for investment. I recommend this scheme for investment. Can a father and mother separately open SSA account for a same girl child ? I opened one PPF account at SBI in my daughter name when she was 5 year old. Now she is 7 year and i want to open Sukanya samirthi account in my daughter name.But when we approached to SBI for opening this Sukaniya Scheme, they refused by saying that as my child has PPF account, Sukanya account can not be open in her name. Is there any such restriction to open this account ? Please let me know . You can open PPF and Sukanya Samriddhi Account both on girl child name.There is no such restriction that if PPF is open SSA can not be opened. This account can be opened for girl child of Indian Origin.No information is available to open this account by NRI.